Three years after Brillz made his breakout appearance on Mad Decent’s free music offshoot imprint Jeffree’s, the Twonk originator has inked a deal with Diplo’s record label proper. He will showcase his forthcoming Mad Decent material on his 40+ date Twonk Di Nation tour. 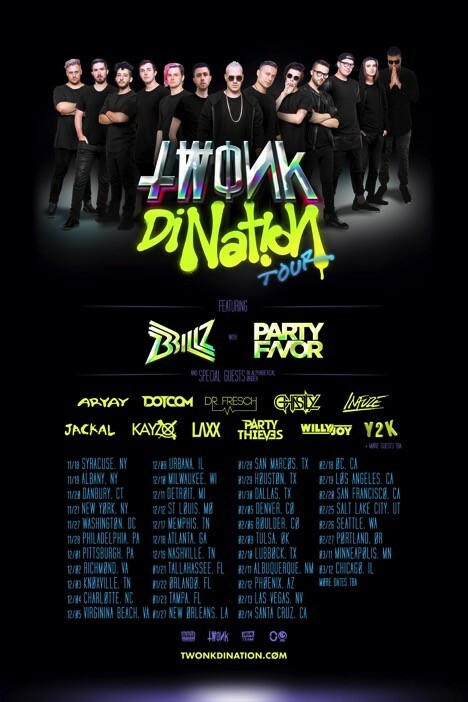 Kicking off 18 November in New York and flitting through North America with stops in Las Vegas, Philadelphia and Milwaukee to name a few, Brillz will be accompanied by his homies Party Favor, Jackal, DOTCOM, Ghastly, LAXX, Kayzo, Party Thieves, Willy Joy, Y2K, Aryay, Dr. Fresch, and Infuze amongst others. Brillz’ Twonk brand - a cacophony of rattling percussion, twisted vocal chops, serrated laser synths and high-octane bass – has apparently permeated dancefloors the world over. After performing more than 150 shows within the last two years including sets at Lollapalooza, Electric Zoo, EDC Las Vegas & Orlando and Nocturnal Wonderland, he is ready to once again serve up a helping of barreling beats on his tour. Although Mad Decent release details are being kept covert, clubbers can expect the same verve felt within his previous two albums – 2013’s ‘Twonk’ and its subsequent ‘Re-twonked’ remix collection – which both broke into the Top 10 of iTunes’ Dance chart.